* Getting out and about in Plymouth while house sitting at my mums with my BF. But instead, It's all gone to pot. 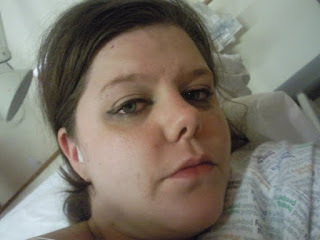 * Being made to wait for 7 hrs before going for my operation (When I was told I would go in at 2.30pm and didn't go in until 6pm) and being told I could go home afterwards, but being kept in - although it was probably for the best as I was knocked for six and still feel iffy now. * The nurse changing my dressing for the first time after surgery yesterday before I was allowed to go home - This seriously was the MOST painful feeling ever, I literally scream and sobbed hysterically .. It was so bad .. Not her fault though, as the wound is left open to heal from the inside out, so there for is packed, and will be packed until it is fully healed :( .. I had it redone at home today and it wasn't as bad but I'm still dreading tomorrow cos she used a different packing. * Being VERY over emotional, I can't help it, I'm in shock and keep on crying because I can't believe this has happened. I woke from the anastethic bawling. * THE BIG Downer for you guys is my whinging, I'm sorry. I'll stop now, otherwise I could go on, and on, and on, and on.. Yep, You get the picture. So, I have a few UPS. * Seeing my mum and sis soon, she gets back from her holiday on the weekend and I know she is so worried about me, I am looking forward to seeing her. - and that is all for now, I think. I'm tired now so might have a lie down. Sorry for the big whinge people, forgive me. Oh my days, Im glad its all sorted now and your on the mend. At least you have your boyfie to look after you and take care of you. OMG that is not even close to whining for what you had to go through. I hope you heal super fast! Feel better!!! Poor you, I didn't realise how bad you were feeling. I know someone that's had the same problem, so know how horrid it is :-( It'll take a while, but you'll get there. Having a boyfriend at a time like now is the time you realise just how much you need them. Bless him. Hope you're feeling much better soon. Oh, this sounds horrible :( I hope you start feeling abit better soon. If anyone deserves a big whinge this week it's you Chicka. Hope you manage to get out shopping tomorrow and buy lots of lovely sparkly things that put a smile back on your face. I'm sorry you're having a rough time! I hope you're feeling better soon.